An exciting new study has revealed that healthy parrots prefer working for their food to eating from a bowl. Parrots involved in feather-plucking, however, go right to their bowls and show no interest in solving problems that led to food rewards. I think this research is important to all who share their homes with parrots. Some progress was also made in developing a medication for birds that have begun to damage their plumage. I have dealt with feather-plucking even in well-run zoos; it’s a sad and frustrating condition, and I hope that this new work points the way to some solutions. Feather plucking is heartbreaking to see, and immensely frustrating to cure. 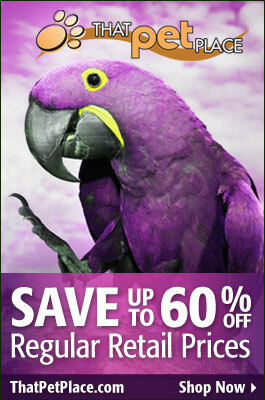 Despite much interest from the parrot-keeping community, foolproof solutions elude us. Feather-plucking and other forms of self-mutilation ruin the lives of countless pet parrots, many of which are eventually turned over to rescue centers, euthanized, or released. Feather plucking (and other forms of self-mutation) is one of the most common concerns raised by parrot owners. I’ve encountered the problem among zoo birds as well. Despite being well-studied, feather plucking remains difficult to both prevent and cure. Our understanding is complicated by the fact that feather plucking can be caused by widely-differing physical or emotional ailments. But some general rules and patterns have emerged. I’ll review these below…please be sure to post your own observations, as we still have much to learn. Feather-plucking may be a reaction to a physical or emotional problem. Sometimes, the reason is clearly physical…as when a bird plagued by mites picks at its feathers and skin. 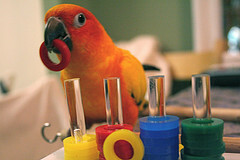 Or the reason may be purely environmental…as when a bored parrot kept in a tiny cage adopts self-destructive behaviors. Holiday visits and celebrations, pleasurable as they are, can also bring some nasty surprises to both people and pets. A bit of planning now can help make the upcoming season safe and enjoyable for you and your birds. Responsible bird owners know that certain holiday treats and, of course, alcohol, are bad for birds. But many overlook the important role that sleep plays in bird health (please see article below). If you entertain late, or will be out often during the holidays, keep in mind that most birds need 10-12 hours of sleep in a dark, quiet environment. If necessary, move your pet’s cage to an area that is off-limits to guests, and shut the room lights via a timer if the rest of your house will be lit after the usual “lights-out” time. Maintaining a stable day/night cycle is good for your birds mental and physical health.